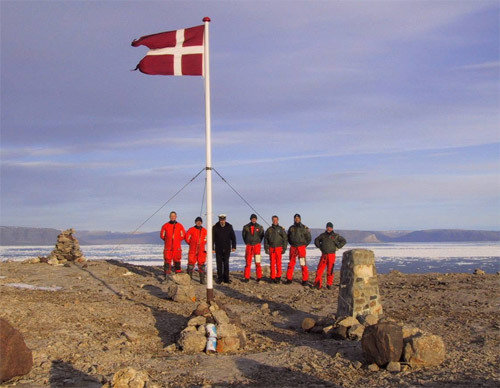 The crew of Danish warship Vedderen perform a flag raising ceremony on the uninhabitated Hans Island off northwestern Greenland, in this Aug. 13, 2002 file photo. The crew was set ashore to erect a new cairn and change the flag and the flag pole. This ritual is performed when the ice situation in the area renders such a mission possible. Midway between Canada and Greenland, both Canada and Denmark claim sovereignty over the island but both sides are down-playing media reports that the issue is raising any tensions.